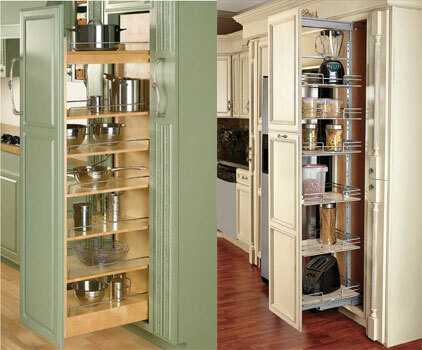 Do you wonder why Metal pantry organization system is better than Wood pantry organization system? We have comparison between the wood pull outs and metal pull outs. Weight : Metal pantry pull out is only 50% weight of the wood pantry pull out. It is easier to pull in and out during usage. Flexibility on Installation : Metal pantry pull out has adjustable supporting mounting bar that can fit inside various pantry opening seamlessly. Wood pantry pull out has no adjustable ability on the overall high of the pull out, this can result for the unfit installation or un-necessary gap between the pantry opening and the pull out. Adjustable Shelf : Metal pantry pull out has easy adjustable shelf that will allow user to adjust the high between each shelf accordingly. No tool needed for the task. Wood pantry pull out has no way to adjust its shelf, in some case even it has the ability to do the adjustment, it will require professional skill and tools.